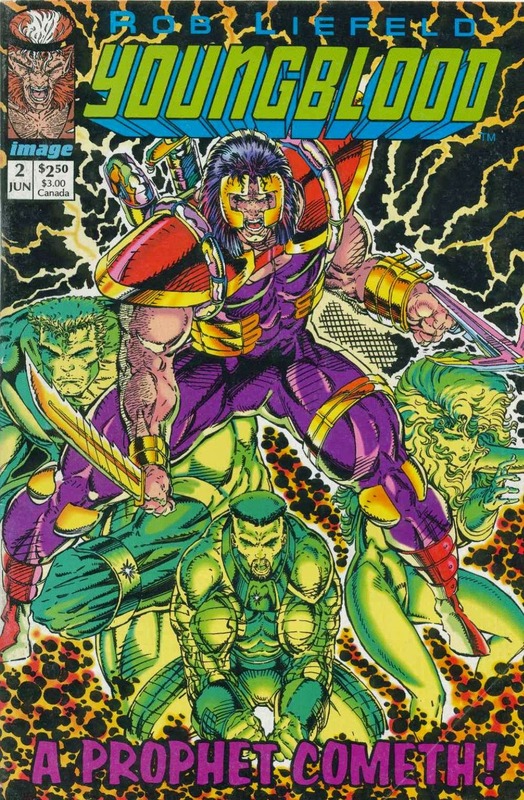 I've read many stories containing characters created by creative powerhouse Rob Liefeld; however his early creator-owned work is a blind spot of my comic knowledge. Oddly enough the 2012 relaunch of Liefeld's Prophet is my favorite ongoing series. Now I seek to learn the origins of this stellar comic through a continuing series of posts analyzing Rob Liefeld's Prophet. Last week Prophet's genesis was examined in Youngblood #2. This week I crack open my second Extreme Studios comic from those halcyon 90's and the first issue of the Prophet solo series. Remember how I promised to be more concise? I lied. Despite Rob Liefeld being a monolithic figure it's important to remember that he had collaborators and give them due credit. Rob shares creative duties on this issue as he is only responsible for being the creator, writer, and doing layouts as Dan Panosian (pronounced Pan-Ocean) takes up penciling and inking. A mountain of a man holding twin knives while casting muscle shadows is almost a great cover. On one hand, it's the complete image of a 90's comic hero I expect and want to read about. On the other hand, the lack of context makes it rather boring. A better use of the picture would be before Prophet's showdown with a villain and accompanied with some threatening line about how Prophet is coming for the bad guy. I'm surprised by how so-so the cover is for a brand new series. Youngblood #2 is the first comic I've read from Extreme Studios' heyday making it a go to point of reference and measuring stick for all the Prophet comics I've yet to read, and based solely on the cover it beats out Prophet #1. Prophet seeks to re-establish contact not only with the satellite that serves as his life-line, but with an ever-changing world that seems to have passed him by..
Shrouded in a billowing purple cloak Prophet broods on a cliff at sunset, judging by the yellow sky, as a Bible quote provides narration on the opening page of the story. Robots with swords descend from a floating bulbous silver thing to interrupt Prophet's reflection and he greets them by pulling out 2 insane serrated swords. As to be expected, Prophet begins to kick robutt. Only 3 pages into the issue is when the first two-page vertical spread shows up of Prophet slicing a robot in half as a squad of robots approach him from behind. That's pretty rad, and what's even radder is the way Prophet is standing implies that he sliced that robot by only moving his arm. Just like that vertical spread in Youngblood this spread quickly establishes how effortlessly badass Prophet is. Liefeld and Panosian come out of the gate swinging by kicking off a comic with action and then fleshing the story out from there. Prophet continues to hack and slash cutting robots in twain, cutting their heads off, throwing them off of cliffs, and the only thing that even hits him during the whole fight is debris from the robots he's just robomurdered. Following a 3rd passage from Psalms is when Prophet's own narration boxes show up and inexplicably change color after one page from Prophet's trademark purple to a light blue gradient. The narration bluntly explains in one page what Prophet is all about. He fights evil, and he does so simply because it's what he believes is right. Stating that these are beliefs that Prophet has held since childhood combined with the line: "My body would be altered and enhanced, but my mind and soul would not" gives the character a driving conviction that is unshakable and his true source of strength. 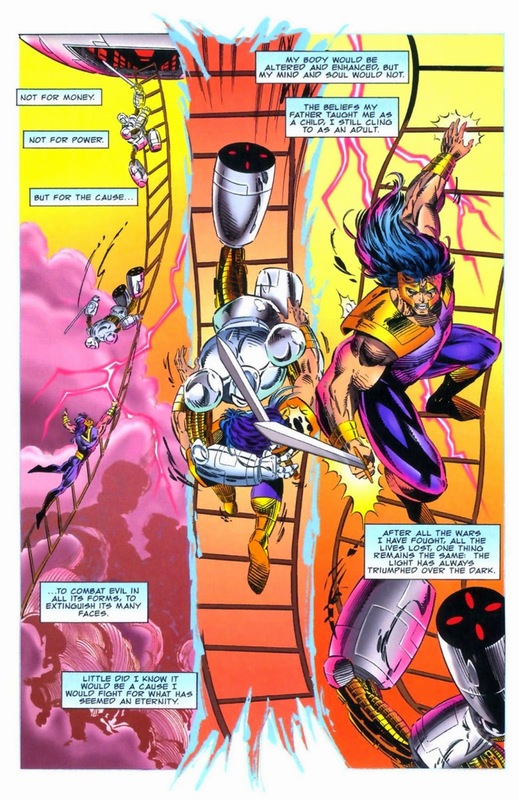 It hints at Liefeld's influences as well as the type of comics he enjoys and wants to create. There is also an assurance that no matter how bad things may get in the end everything is going to be alright. 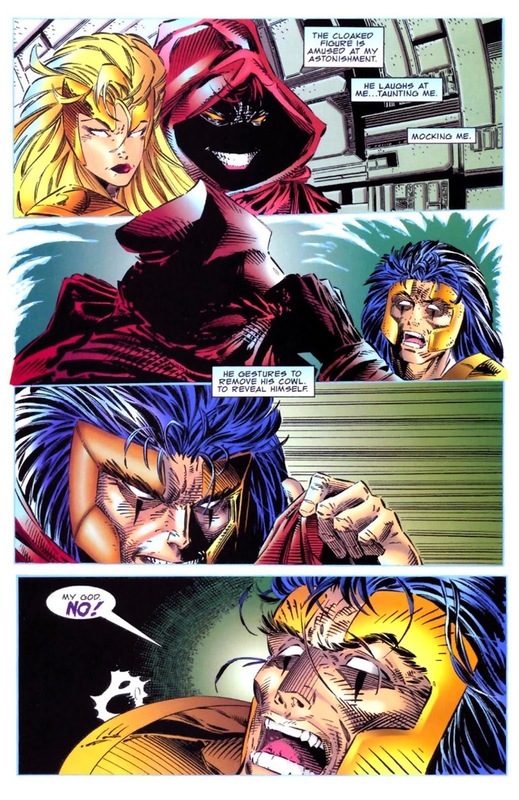 A lot of people probably associate Rob Liefeld with the advent of the 90's anti-hero carrying big guns and operating with extreme prejudice, but these few pages create a truly heroic and optimistic character. As this is all being explained Prophet manages to make his way into the airship via rope ladder in a sequence that is notable for how weird it is in both the actions depicted and how the panels are arranged. Once inside the ship, stuff somehow gets even weirder when the 2nd vertical spread of the book hits. Who these two characters are is a mystery. Prophet clearly knows the woman, but I've no idea who she is or why she is important to Prophet. Either this is en media res that falls flat or the assumption that the reader is familiar with her character is incorrect. At least the identity of the hooded figure is intentionally nebulous as the big reveal to who this evil grin belongs to is shocking. Or it would be if the panel composition was a bit clearer. Regardless, it was Prophet! The muddled and confusing sequence ends in over-dramatic fashion as Prophet responds with a resounding "NOOOOOO!" Turns out the robot fight and everything that happened on the ship was a dream. Usually revealing that "it was all a dream" is lazy/poor storytelling. In this instance though it is a well pulled off technique due to the strangeness of the sequence both visually (yellow sky, pink lightning, panel borders/layout, suddenly in space) and based on the transition from randomly fighting robots to being confronted with a confusing and frightening image. Prophet awakes from his nightmare to a bizarrely positioned Kirby hovering over him. The exchange between the two reveals that this is a recurring dream of John's. This makes the preceding sequence somewhat more pedestrian for the Prophet and Kirby, but makes it even stranger for the reader. Those 13 pages really captured a dreamlike sensation of attempting to do a simple task but failing, however the conclusion to the sequence is lacking. Unfortunately the issue continues to lose steam as it jumps into more exposition by expanding on the origin of Prophet touched upon in Youngblood #2. All that it does is explain why Prophet was sealed in a cryo-tube (so Hitler wouldn't find him) and make Kirby a key member of the staff that helped turn Prophet into a super soldier. Kirby then caps the exposition by reassuring Prophet that his mission to fight evil is just. The only discernible purpose for this story beat is to show that Jack Kirby's influence on Liefeld is such that Jack directly helped to create Prophet. Young Kirby's appearance in the flashback is a bit startling as he has what my buddy Jake described as "big manga eyes." An error occurs here too as Extreme Color or the letterer, Kurt Hathaway, mistakenly color both Prophet's and Kirby's narration boxes green. Prophet will have his boxes colored 4 different ways by the time the issue is over. Expanding on Prophet's origins even more is frustrating as it spends unnecessary time to belabor the easily grasped concept of Prophet being a man out of time, and even worse is that earlier in this same issue Prophet's character was masterfully established without causing a pause in the action. The brief exposition interlude concludes as Prophet and Kirby prepare to parachute down to an Alaskan installation that will help Prophet reconnect with D.O.C.C. Kirby displays his manliness by jumping out of a plane into the snow covered landscape with nothing but a harness of pouches to keep his upper body warm. That is undeniably awesome. 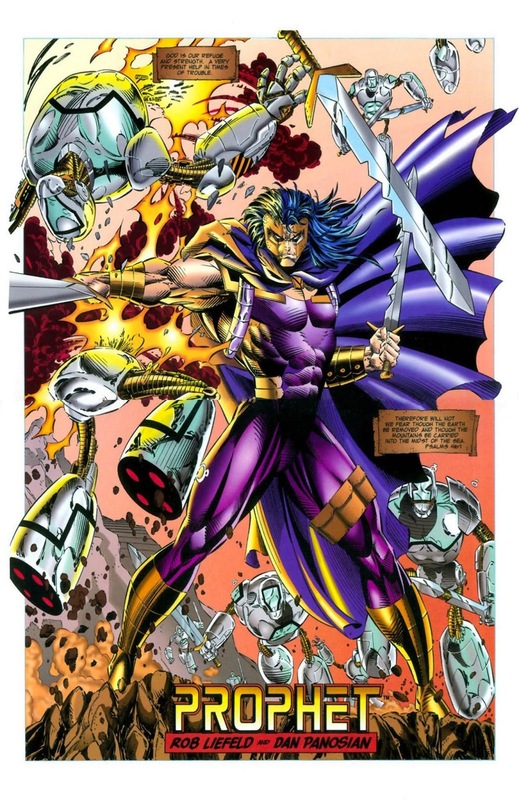 The best page of the whole plane sequence though is the full page spread of Prophet standing with big ol' knives in each hand as he utters a line full of grim determination. With action on the horizon another detour is taken to the shadowy interior of the Pentagon. 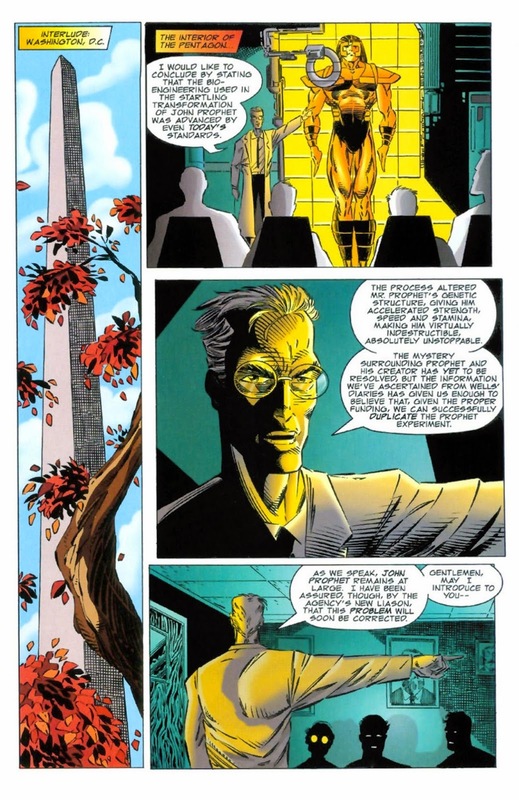 An oft forgotten rule to making good comics is to show not tell, so an off model Washington Monument is drawn to establish the setting. I haven't been, and will continue to avoid, pointing out every anatomical inaccuracy in the series, but it's hard to overlook an illustration of an obelisk that somehow makes it even more phallic. Using the Washington Monument as the establishing panel for a scene in the Pentagon is a weird choice seeing as how the Pentagon has a distinct look that could easily be used to set up a scene. Inside the 5 sided building, a scientist gives a brief in which he talks up how super awesome Prophet is and how they now have the know-how to make a new Prophet. 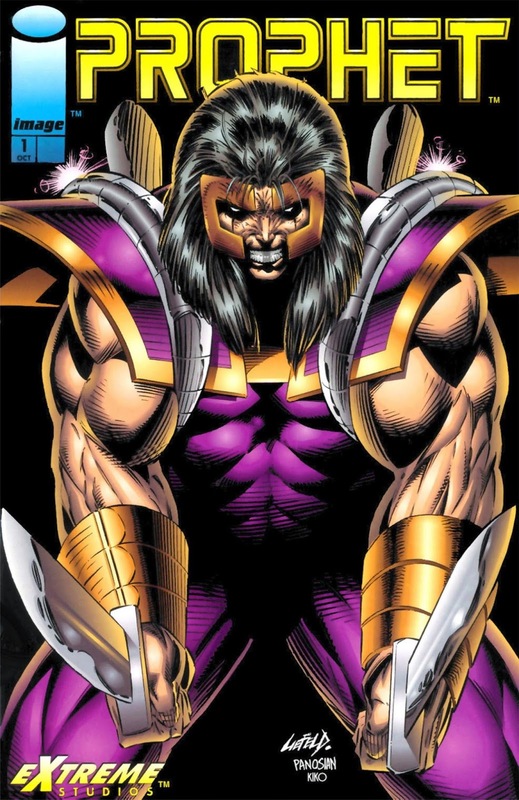 The government is after Prophet for "reasons" and have Bloodstrike and Youngblood teams at the ready. Here it is also revealed that Mary, the buxom blonde in Prophet's dream, is instrumental in the manhunt to bring him in. The first issue of Prophet ends the same as Youngblood #2 with a two-page vertical spread, bringing the total in this issue to 3 as well. Perhaps Extreme Studios had a quota. Only by reading the next issue of Prophet will I know. At the end is a missive by Liefeld giving props to all those working on the comic and non-religiously advocating for people to read the bible. 2 full page poster style spreads are also included. In his closing letter Rob mentions that the character of Prophet is a product of his fascination with the concept of a man out of time that he has had ever since he read the tale of Rib Van Winkle. It's a concept used in a well trod but nevertheless affecting way of showing how isolated Prophet is in this new world. Not only does he not know anyone besides Kirby, but a connection that has to be assumed to be pretty deep (the one with D.O.C.C.) has been severed as well. Battle is the only familiarity Prophet finds in the new world. This sets up a compelling internal struggle as combat provides comfort and helps ease his mind, but the temptation to lose himself in battle creates a darkness within that haunts Prophet's dreams. What drove me to undertake the task of reading every issue of Prophet is how thoroughly I enjoy the 2012 relaunch of the series by Brandon Graham, Simon Roy, Giannis Milonogiannis, and friends. Finding meaningful connections between modern Prophet and the Prophet of yesteryear will continue to be an objective as I make my way through the classic iteration. Two aspects in particular stuck out in this issue. Right off the bat the story of the two Prophets echo each other as Jonathan Tyler Prophet (of the 90's) and New Father Prophet (of the relaunch) are tasked with connecting to a satellite. In both instances these satellites operate like a higher power giving the Prophets strength and a focal point for their greater missions. Another link between the two comics is Prophet forgoing guns in favor of using knives. 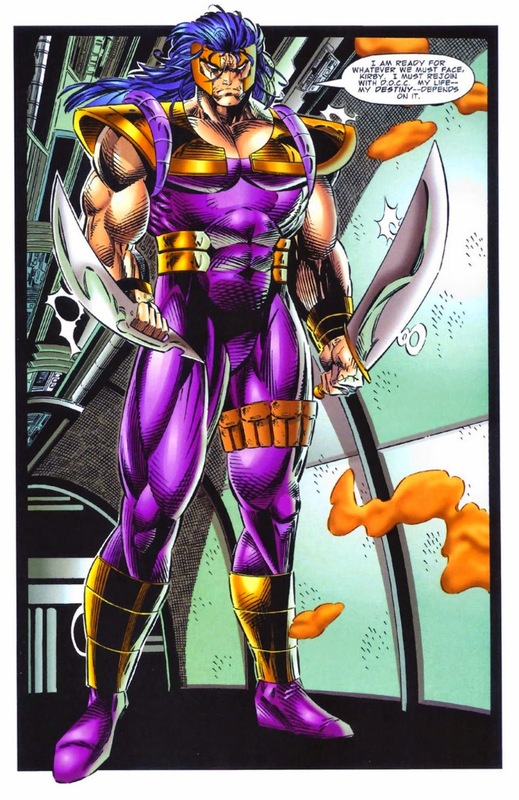 Rob Liefeld's penchant for drawing impossibly large guns has reached memetic status, so it is surprising to find a lead character of his that wields nothing but blades. There has been no overt in-universe explanation for why Prophet refrains from using firearms. Maybe Prophet strives to only use weapons that would have been available during Biblical times. Prophet #1 is a rollercoaster of a comic. My first read of it left me a little cold; however the more I thought about it the more I liked it. Finishing up this post though reminds me why I didn't really like it at first. The first half is excellent, and a clinic for how to establish a character. It's a shame that the remainder of the comic quickly loses momentum as soon as the fighting stops. It's not just a matter of there being less fighting robots or robot fighting either. The story and paneling becomes uninventive and by the numbers as if Liefeld and Panosian got bored halfway through the comic. I still enjoyed reading, but ultimately Prophet #1 isn't as fun as the previous issue of Youngblood. Hopefully subsequent issues manage to strike a more consistent balance, because if the whole thing was as good as the first part then it would be so good.